Separate dough into 8 biscuits. Cut each biscuit in half; press with hands into circle about 3 inches in diameter. In center of each biscuit round, place 2 tablespoons cooked ground beef (or 1 meatball) and 1 cube of cheese. Wrap dough to completely enclose beef and cheese; pinch seams to seal. For the Fried Version: Wrap each stuffed “bomb” with 1 bacon slice; gently secure loose bacon with toothpick by inserting it through bacon and halfway into “bomb.” In 3-quart heavy saucepan or deep fryer, heat oil to 350°F. Fry stuffed “bombs” 4 to 5 minutes or until dough is golden brown on all sides. Place on paper towels to cool. Repeat with remaining “bombs”. Serve warm with ketchup and mustard, if desired. For the Baked Version: Heat oven to 400°F. Place bacon on foil-lined cookie sheet with sides. Bake about 8 minutes to partially cook bacon. 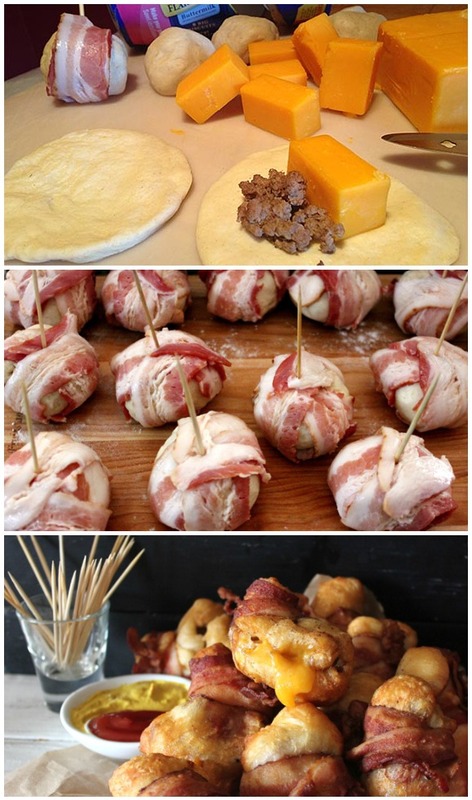 Wrap each stuffed “bomb” with 1 slice partially cooked bacon slice. Place bacon wrapped dough 2-inches apart on two foil-lined cookie sheets with dough seam side down. Bake 13 to 15 minutes or until golden brown. Serve warm with ketchup and mustard, if desired. can this be kept in the fridge over a few nights after cooked ?